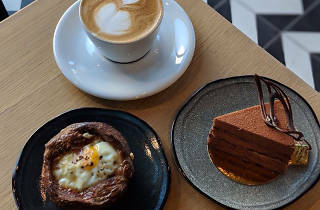 This new cafe—a spinoff of Italian mainstay Piccino—is as delicious as it is beautiful, adorned with black-and-white zigzag tile floors (the setting of many a #shoefie) and marble counters. The thoughtful breakfast menu spans sweet to savory, from the pocket sandwiches (try one “Noon-style”, with poached eggs, braised greens, chile oil, and cortido) to the pan de mie French toast with blueberry compote and maple syrup. 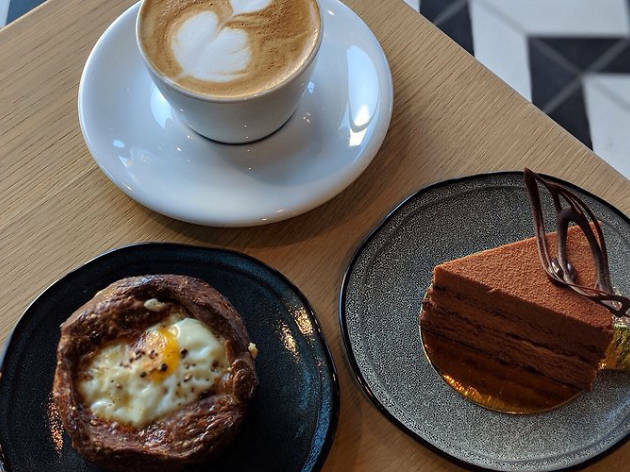 Don’t miss the pastry case, stocked with treats like kimchi danishes, ginger and apple scones, and the ingenious Sunny Side In: brioche garnished with gruyere, a farm egg, & everything bagel seasoning. If any baked good could dethrone Craftsman and Wolves’ The Rebel Within, it’s this crumbly masterpiece.